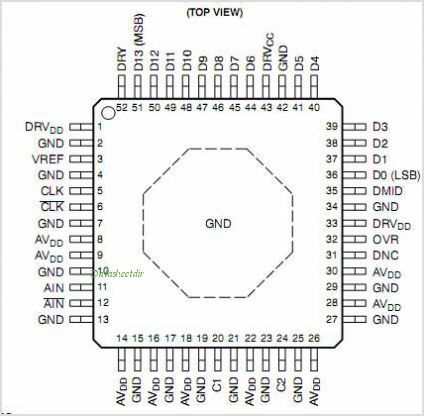 The ADS5424 is a 14 bit 105 MSPS Analog-to-digital converter (ADC) that operates from a 5 V supply, while providing 3.3 V CMOS compatible digital outputs. 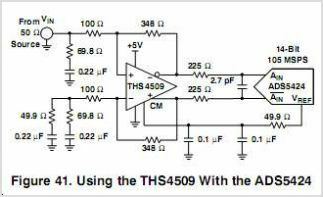 The ADS5424 input Buffer isolates the internal switching of the on-chip Track and Hold (T & H) from disturbing the signal source. An internal reference generator is also provided to further simplify the system design. The ADS5424 has outstanding low noise and linearity, over input frequency. With only a 2.2 VPP input range, simplifies the design of multicarrier applications, where the Carriers are selected on the digital domain. The ADS5424 is available in a 52 pin HTQFP with heatsink package and is pin compatible to the AD6645. The ADS5424 is built on state of the art Texas Instruments complementary bipolar process (BiCom3) and is specified over full industrial temperature range (?40C to 85C). This is one package pinout of ADS5424,If you need more pinouts please download ADS5424's pdf datasheet. This is one application circuit of ADS5424,If you need more circuits,please download ADS5424's pdf datasheet.